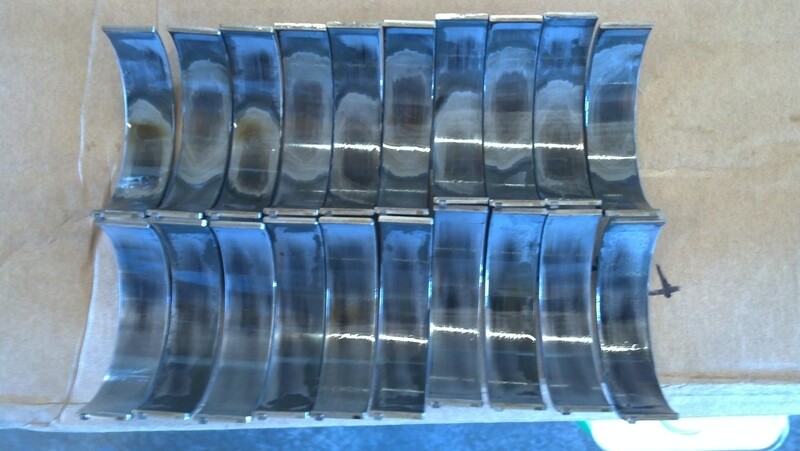 Here's another data point - Attached a few (sorry about the photo quality) pics of rod bearings removed from a salvaged long block out of a 2007 M6 with about 32,000 miles. There was nothing unusual about the maintenance history that I could find. The main photo shows cylinders 1 thru 10 from left to right, piston side bearing shells are on top, cap side shells on bottom. Wear on top shell was pretty consistent with copper just starting to show in a few. New red/blue BMW bearings went in with Plasti-gage checks showing clearances are in 0.002-0.0025 inch range. 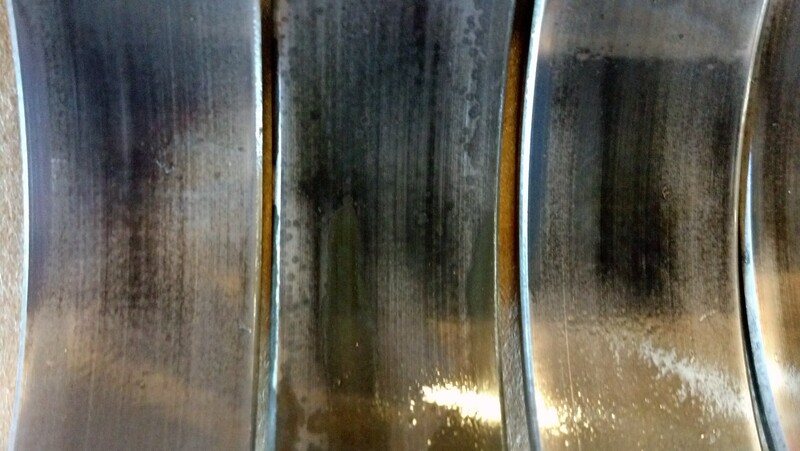 Note - brownish spots on some bearings is oil puddling. RDS sway bars, SST brake lines. Thanks for sharing. We haven't seen a good set yet. Those look worse than mine which were at 50K. Another example of how well TWS is working. NOT. I'm at 42k miles, I was thinking on waiting to 50k miles to do this. I'm having second thoughts! My car had 31k miles when I got it (just 2 oil changes per bmw) it was a 1 owner. I'm not worried about the previous owner but the time it spent at the dealer before I bought it ( about 2 months). I know it took a lot of hard test drives and who knows if the oil was up to temp. But this was in Puerto Rico ( hot all the time) any thoughts ? I know you'll do it yourself. 600.00 is cheap insurance then you'll know. Get the WPC treatment. I see you have an 06. Put a new vanos line in there but don't remove the vanos pump. Too hard to realign and it doesn't have to be pulled to do bearings. Last edited by B767capt; 11th October 2013 at 09:55 PM. I'd expect similar looking wear. The pics I posted were from a NY/MD based car. Not warming oil up before "spirited driving", combined with tight clearances seems to be the leading hypothesis on accelerated wear. 10W-60 exacerbates the problem in cold climates. BMW just changed their oil recommendation on the S85 (among others), the first official acknowledgement of an issue IMHO. 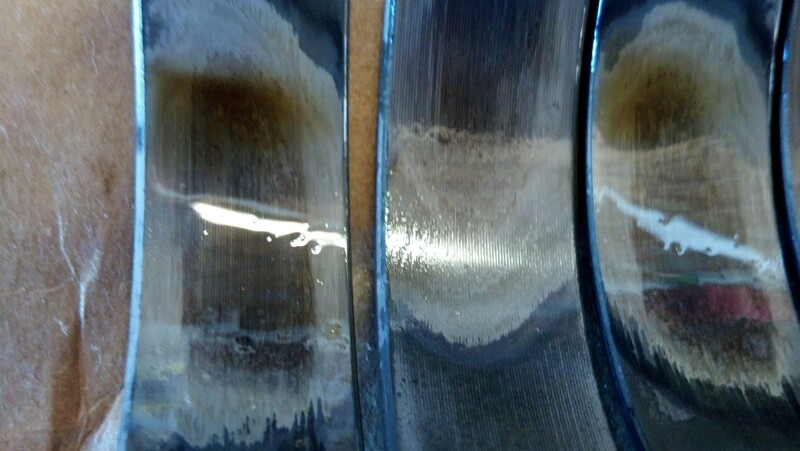 I'd can't say what condition your bearings are in and an oil analysis may or may not tell you anything without a full trend history. If it's not knocking, and you carefully warm up, you should be ok for a while, but that's just a guess. Sorry I can't be more helpful than that. Ili probably do it when I store it for the winter in a month or so. You are right I'm doing it myself on jack stands! Wally did his on jack stands. Not for the faint of heart. Fiftytwoeighty and PRM5 like this. I live in Hong Kong weather is hot and humid here and my road bearing were in worst shape that those after only 60000km and I ended up with a failed engine !! My advice is replace yours ASAP ! !